Draws on the latest research in psychology and neuroscience to show how the rational and the emotional faculties of the mind work together to shape the fate of each individual and how they shape everything from personal success to physical well-being, in an updated, tenth anniversary edition of the best-selling study. Reprint. 50,000 first printing. 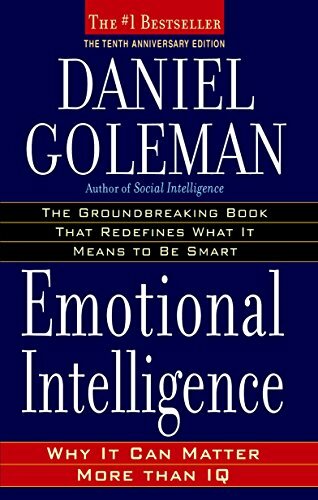 Amazon.com description: Product Description: Everyone knows that high IQ is no guarantee of success, happiness, or virtue, but until Emotional Intelligence, we could only guess why. Daniel Goleman's brilliant report from the frontiers of psychology and neuroscience offers startling new insight into our âtwo mindsââthe rational and the emotionalâand how they together shape our destiny. The best news is that âemotional literacyâ is not fixed early in life. Every parent, every teacher, every business leader, and everyone interested in a more civil society, has a stake in this compelling vision of human possibility. About: Everyone knows that high IQ is no guarantee of success, happiness, or virtue, but until Emotional Intelligence, we could only guess why. About: Now you can effectively incorporate Emotional Intelligence in your classroom. About: Draws on the latest research in psychology and neuroscience to show how the rational and the emotional faculties of the mind work together to shape the fate of each individual and how they shape everything from personal success to physical well-being, in an updated, tenth anniversary edition of the best-selling study. About: Based on the most recent studies in psychology and neuroscience, a report on the rational and emotional properties of the human mind explains how they shape everything from personal success to physical well-being.